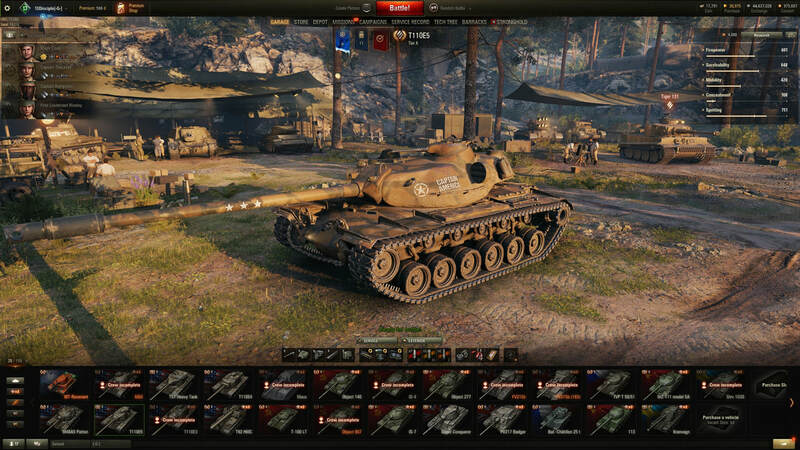 As a whole the T110E5 is the ‘jack of all trades master of none’ heavy tank. It’s good in many aspects and lacks equally in others. The definition of a mediocre tier 10. Overall it’s serviceable on the battlefield and in the hands of a skilled player can carry a match, however casual players may struggle to make this vehicle work for them consistently. NOTE: This guide is my perspective, and is not guaranteed to help you. Other players may disagree with my suggestions and that's OK. If you are having trouble after implementing what I recommended in this guide, I suggest you experiment with load outs, crew skills, and play style to see what works well for you. *Make sure you train Situational Awareness (radio operator) before you train Recon (commander). This is because Situational Awareness at 100% yields a 3% boost to view range, while Recon at 100% only yields 2% boost to view range. In my opinion the triple MoE can be achieved with a standard Gun Rammer. ​I used the HE rounds for the rare instance I came across a lightly armored tank such as the FV4005, or desperate cap resets. Really you can run w/e ratio you want - if you find yourself running out of a certain ammo type, don’t be afraid to adjust your load out. Special note on consumables, I ran an automatic fire extinguisher, along with standard repair and medkits, until I was around 90% MoE. After that I switched to large kits, and food. I also applied the firefighting directive to make up for the lack of fire extinguisher. 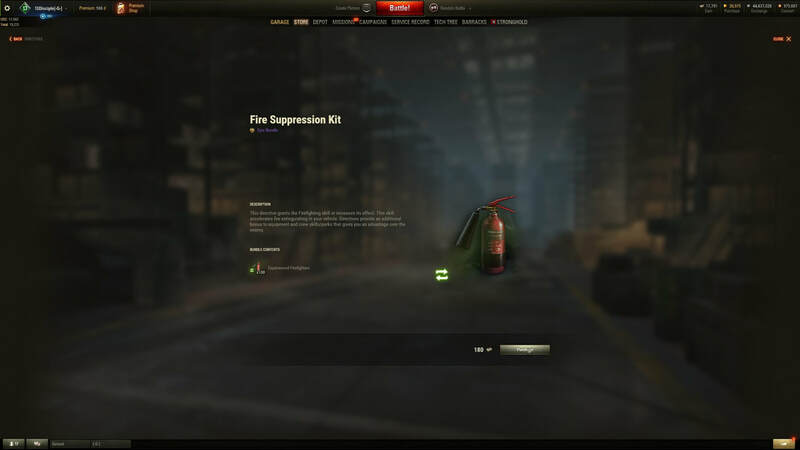 You can purchase a single directive for 2 bonds or alternatively and I recommend this, you can buy a bundle of 100 fire fighting directives for 180 bonds - saving you 20 bonds in total. ​This is likely the most redeeming factor of the T110E5. The gun handling is excellent. It won’t snap shot quite as well as an FV215b, but it’s nearly as good. Mid to long range engagements may take an extra moment in aiming, but for the most part it’s easy to get the gun on target and aimed very quickly. The penetration for silver at 258mm is good enough for most tanks it can see if firing at weak spots. Notable exceptions would be the Japanese heavy tanks. No worries, as the gold penetration is excellent at 340mm. You cannot be afraid to fire gold, especially if you are closinging in on 90%+ MoE. The DPM is maybe the weakest point for this gun. Combine the unimpressive DPM and a relatively average alpha (400) it notiecably lags behind higher alpha tanks such as the 5A or 113. The difference is the higher alpha tanks will take additional aim time due to worse gun handling. Despite average DPM the gun handling means you are never waiting for the gun to settle before firing. ​Mobility for this tank is a bit of a mixed bag. The top speed at 37 km/h means it’s just behind the fast heavies found in the Russian and Chinese tech trees. Combine this with the relatively high power to weight ratio means you get up to speed pretty quickly and climb hills relatively efficiently. You’ll certainly be able to beat super heavies to important map locations, but be aware that any fast heavies on the opposing team will generally take important positions before you and be pre-aimed for a shot at you. The relatively good speed also means you are able to chase damage at the end of match as well - if you survive that long. Traverse and soft stats keep the tank relatively nimble, the most glaring downside of the T110E5’s mobility is the horrific reverse speed at 12 km/h. This stat, in my opinion, really needs a buff. I suppose the designers of this tank assumed it would never need to fall back. If you are attempting to work a ridge line be aware that most fast firing tanks will get 2 shots into you before you can reverse back behind cover. I found myself many times taking extra damage simply because backing up is so slow. Keep this in mind - because if you make a mistake in your positioning you’ll pay for it with hit points before you can reverse out. Sitting at 2200 HP means that it’s on the low side of most heavy tanks when comparing how many penetrations it can survive. Worse yet, when facing HE tanks such as Type 5/4s, or playing in a match with artillery means you won’t survive long even when you can angle your armor well. Combine this with it’s unreliable armor and you begin to see that this tank doesn’t have the girth to hold the line on it’s own. The frontal weak points create quite the challenge - the commander’s hatch on the top of the tank, and the lower glacis plate. This doesn’t mean you can’t use the armor, it just limits its usefulness to very specific locations. 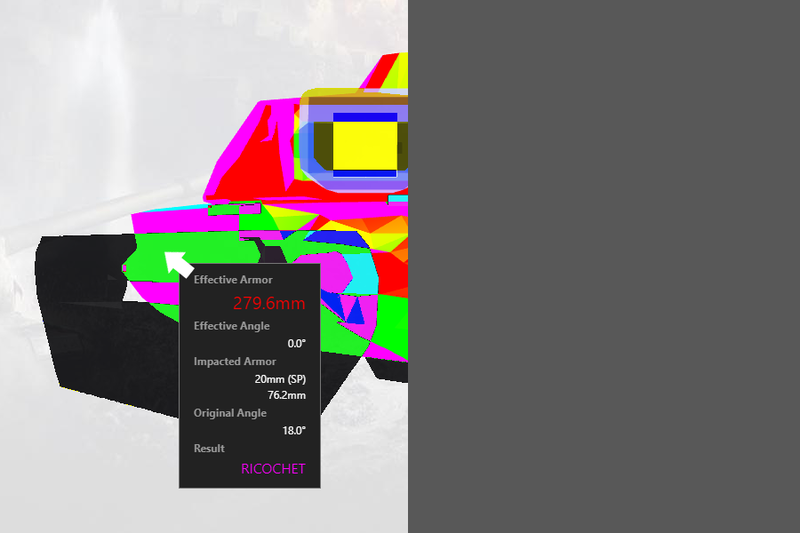 The most efficient use of the armor at close range would be a side scrape when reversing to the right. You hide the commanders hatch and minimize or eliminate the exposure of the lower hull as well. 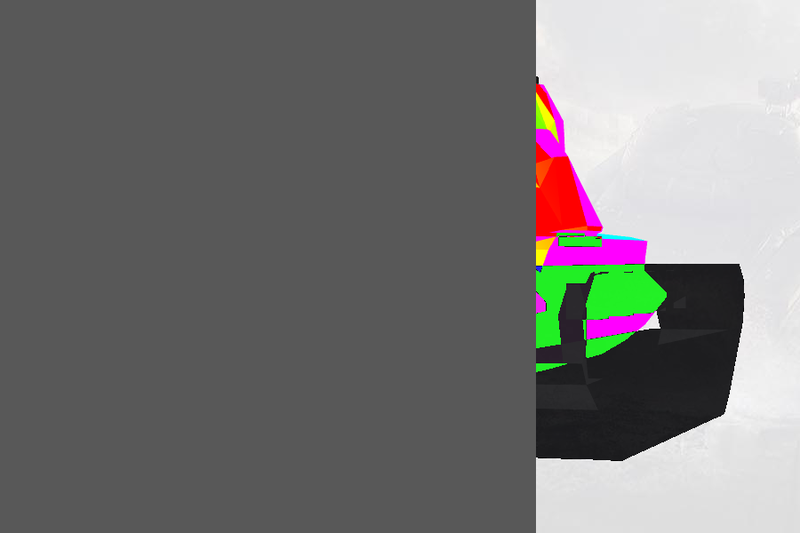 There is a lot of spaced armor along the sides due to the tracks. I’ve baited many shots into my tracks for 0 damage. Reversing to the right means you hide the commander’s cupola as well, or at least limit its exposure. Note that this can somewhat work well against HE tanks, if they get that shot into your tracks, the spaced armor can lower the damage you take (note - you’ll still be taking a lot of damage). Heat and AP rounds can get eaten up in the tracks for no damage. Quickly and with slight movement rock forward and back to bait the shot into the ricochet on the cupola. That doesn’t mean you can’t reverse side scrape to the left either - your best option is to dance by rocking the tank forward and backward exposing just the edge of the hatch. You want to bait the shot or make the enemy rush to hit it. Despite it being a weak spot if you don’t shoot the center of it, you are likely to bounce it. Please avoid dancing if you have team mates nearby attempting to fire down the same corridor. They could end up hitting you, or missing an opportunity. In this instance, just wait for highest alpha tank to shoot at your ally, and then reverse out. It's worth mentioning that if you are on a ridge line, use as much of your gun depression as you can to make the cupola as small as possible from the enemies' perspective. The unreliable armor leads me to the last point - engaging at distance. The gun handling on this tank means its ideal location is medium range. Similar to the T26E4 - even if they aim at your weak spots at range there is a good chance the dispersion will either force the shot wide, or into a well armored location. If you must play at short range, keep moving! The commander’s hatch isn’t small but a moving target is harder to hit. You have excellent gun handling so there is little need to stop moving. One last comment, something I’ve done, but didn’t do often was raise my gun barrel to cover the commander’s hatch. This can and does work. Good players will hold their shots until they get a clear one (reducing the dpm) others will just rush the shot and could hit your barrel or miss entirely because they tried to shoot around your barrel. It won’t work all the time, but when it does that’s an extra shot of hit points you carry the rest of the game, which could mean one more shot of damage, one more trade, which pushes that MoE up that little bit more. Building off of the previous observations, the tank is ideally suited at medium distance. When forced to engage short range it should be used in a support roll. In 3/5/7 match making you can generally play aggressively depending on the tier 10 heavy(s) on the opposing team. When facing teams of 2 to 3 artillery, either stay dark, in cover, or push hard. Letting arty hit you every 30 seconds without doing any damage, or spotting allows your hit points to get whittled away with out any benefit to your mark, or worse yet for your team. Also worth mentioning when playing against teams with More than 1 Arty, keep your distance from your team mates. Strong artillery players will look to stun the most vehicles possible, meaning they will splash in the middle of clustered tanks leaving you high and dry. Good Arty players may focus solely on you in a 3/5/7 match as you are one of the greatest threats on the other team - which again if you are separated that means only you get stunned leaving the remainder of your team in full fighting condition. It's generally a good practice to get into that if you are in a map location vulnerable to artillery you should be placing space between yourself and your teammates - as much as you can without diminishing your ability to engage in the area that you are in. A key to success in this tank is using as much of your armor as you can. The longer you survive the more damage, and the more spotting you can do. Many times you’ll get free damage at the end of match simply because you’re alive to take it. One last thing to note is that you should be shooting high health tanks. When presented with a full HP tank and a 100 HP tank, wasting a shot to kill a 100hp tank means that for the match you are 300hp less on your MoE. This practice does not help you win matches, or help you with experience. I don’t recommend playing this way unless you are purposefully grinding your MoE. If you want to help your team win games, shoot the lowest HP tanks to remove them from the battlefield quickly. Make use of your view range! I ran optics to take advantage of assist damage. If Your friendly arty are pinging their reload, and their aim. They will let you know when they are ready to shoot at a tank you can spot. Roll out just enough to light them, and soak up all that extra spot damage. The large commanders hatch also means that the vision checks are at a high point on your tank and you can limit how much you expose your tank to get spotting damage. Spotting damage easily made up 1/4 to 1/3 of my overall MoE. My last bit of advice is for you to find talented tankers that stream regularly and watch them play. Watching successful players will almost always reveal new map locations, or strategies you might not discover on your own. The expected combined damage for the T110E5, is lower than most tier 10s. 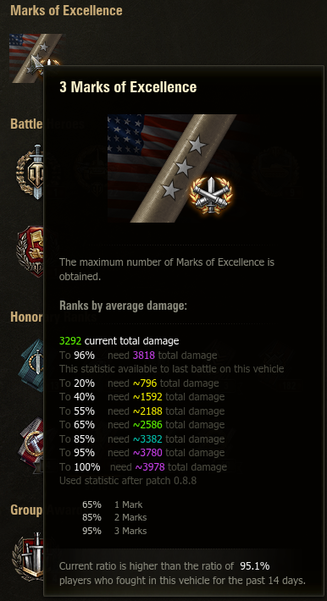 As of the writing of this article for the NA server, to earn a 3 MoE on the T110E5 you need a combined average damage of around 3800*. This means you’ll want to try and average your combined raw damage, and assisted damage to over 4K. Games that are between 3.5 and 4K will for the most part leave your MoE where it is (only changing up and down by minimal amounts). Anything less than 3.5K will lower your Mark, and anything above 4K will raise it. The higher above 4K the more it’ll raise. *Note that the average combined damage of the server is recalculated every day at server reset, and the numbers can be different by region. These expected values are based on the game balance, and players at the time that the mark was achieved. ​If that doesn't make any sense to you I suggest you review my article on How MoE Work. Questions or Comments? Drop into Discord or Join me on Twitch! Friday - 9pm - ? ​For Schedule Deviations join DISCORD!